Digital audio can sometimes sound lifeless or brittle. 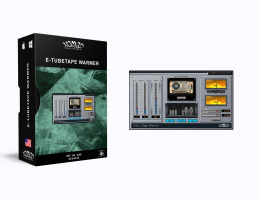 Add some analog warmth and drive to those tracks with Nomad Factory's Tube/Tape Warmer. This effect gives sterile audio the coveted sounds of tube circuitry and analog tape saturation. Engage the 12AX7 tubes (A or B) and increase the drive control individually for extra bite. You can independently add the sound of analog tape rolling at 30 or 15 ips. Use the Tone control to dial in just the right amount of high or low frequencies to highlight the added warmth.